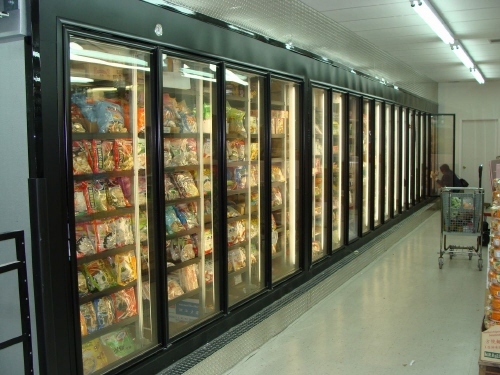 In low-temperature environments, retailers are looking for high performance, durable construction, and exceptional energy efficiency in their display cooler. Barr walk-in display freezers are manufacturered of high quality wood frame construction with polyurethane foamed-in-place tongue and groove cam-lock panels with Gemtron energy efficient glass doors. All new walk-in display freezers are NSF (National Sanitation Foundation) Certified, UL Electric Listed, with Class 1 Foam and USDA approved materials, polyurethane used is CFC free. Nearly every modern American home has a freezer, most likely attached to a refrigerator. But why do we freeze food? To store for later the food we wouldn't be able to get to in a couple of days if we put it in the refrigerator. So that huge pot of beef stew goes into the freezer, alongside that revolutionary 20th century invention: the frozen dinner. But the need to store food for later -- or to create ice for keeping drinks cooled -- is far older than leftovers and TV dinners. It goes back about as far as civilization itself. Thousands of years ago, ancient Mesopotamians discovered that cold food rotted more slowly than food left outside [source: Shepherd]. So, they dug big pits into the ground, insulated them with straw or sand, and then topped them with ice and snow from the nearest mountains. These pits, or ice caves, were used to preserve the food for two or three weeks at a time. Mesopotamians understood that warm air from outside could prevent the snow from cooling the food, so the entrance was kept small and narrow to prevent air seepage. This was how food was preserved for centuries until about the late 1600s, when England and France created their own version with the invention of the ice house [source: Martin]. Although many were at least partially in the ground, some were designed as thatched roof pits that could keep food cold or provide chipped ice for drinks and desserts -- with the help of snow and ice brought in from lakes -- for about a year. The process was similar to the ice cave, with an insulator such as sawdust or small branches that was topped with snow and sawdust. These eventually gave way to the creation of the icebox, a small cabinet that had a compartment for holding a large block of ice and another compartment for storing food. These were common until about the 1920s, when electric refrigerators and freezers began to make their debut. By then, science and industry had established the idea of mechanical refrigeration, in which a circulating chemical gas kept things in a compartment cold. That's why today's mechanically circulated vapor-driven freezers are a little more complicated (and efficient) than hollowed-out ice caves filled up with mountain snow. Up next, we'll find out how several scientific discoveries led up to the creation of the modern freezer we use today. ﻿Advanced Professional Air-Conditioning & Ventilation Services are one of trade's fields we can assist you with. With professionalism and customer focused mind we have, we are very confident you will be more that satisfied with the quality of work.